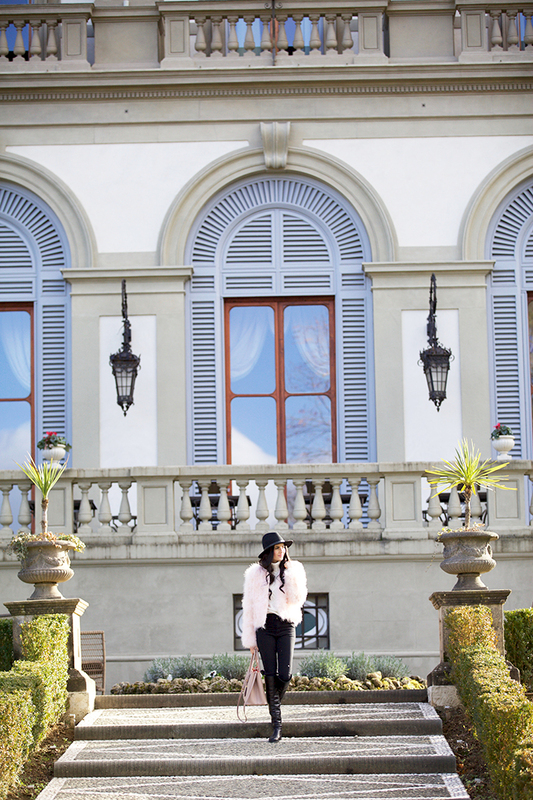 Here’s one of my favorite looks from our time in Florence! It is SO good to be home but I’d be lying if I said I didn’t miss the beauty of Italy. It really was such an unforgettable trip and I have a deeper love for traveling and exploring! Have a great Thursday! Your coat and bag are the perfect shade of blush, I love it! The all black adds the perfect little bit of edge. I so need to add Florence to my must-visit list, I’ve never been to Italy, but I’ve heard such amazing things! Looking absolutely stunning in this chic outfit! Your jacket and hat are marvelous! You are so gorgeous! I love that fabulous jacket you’re wearing. So cute!! Love the jacket!! I found an almost identical one at H&M a while ago and I wear it SO often! It’s such an easy piece to throw on over anything! So lovely! I’m obsessed with that jacket!!! Florence is one of my favourite cities. So glad to hear you loved it too. Love the bag! Florence is such a beautiful place. I cannot wait to make it out to Italy one day. This look is gorgeous! I love the blush jacket. I saw this look on Instagram and loved it. So beautiful. I need to visite Milan. Because it’s not so far away from Germany. What a beautiful background for your photos. I’ve always wanted to visit Florence. 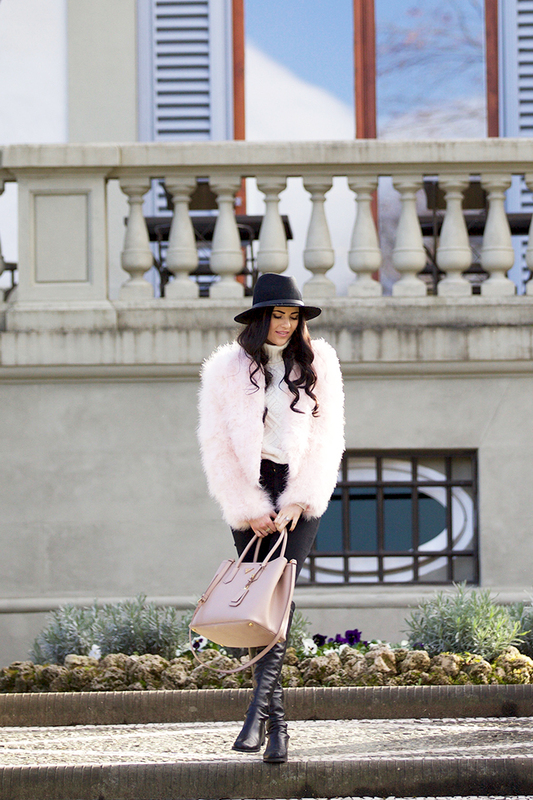 I’m loving that chic blush coat on you! Love the handbag! Looks like you had an amazing time on your trip! I love that coat, such a great outfit! Hope you have a great day babe!! Sending loves! Loving that fuzzy pink coat! So on trend! This outfit is so nice! The jacket and the bag! Italy is beautiful, I’m glad you loved it. Nice jacket! Simply chic and feminine..I love your style can’t get enought!!!!! I love the blush and black pieces together! That coat looks so chic and cozy! Amazing photos! Where exactly in Florence is this? I would love to visit there!! This post is absolutely stunning!! The scenery, the hotel, and of course YOU!! So beautiful!! You pull off the fuzzy coat so well! I am always eyeing them and my husband just looks at me like,”seriously!” But one day I am totally going to go outside my comfort zone and pick one up! This was one of my favorite looks of yours when you were in Florence. So pretty! Stunning photos! I love the scenery! What a gorgeous place for a shoot!! I so love your accessories here, especially the boots! I’m loving this outfit! At first I thought this was the outside of your house until I read your post! The buildings there are so beautiful! Holy cow that jacket is so perfect, I need it in my life ! Probably one of the cutest things I have ever seen ! Gorgeous look girl ! I love Italy too, even though coming home is nice it’s hard not to miss a place like that! Love your boots! that feather coat looks so soft! Lovely photos! Florence is one of my favorite cities! Love how fluffy the coat looks! gorgeous! still so jealous of that trip- it looked unreal! Absolutely stunning U…. !Absolutely stunning location. 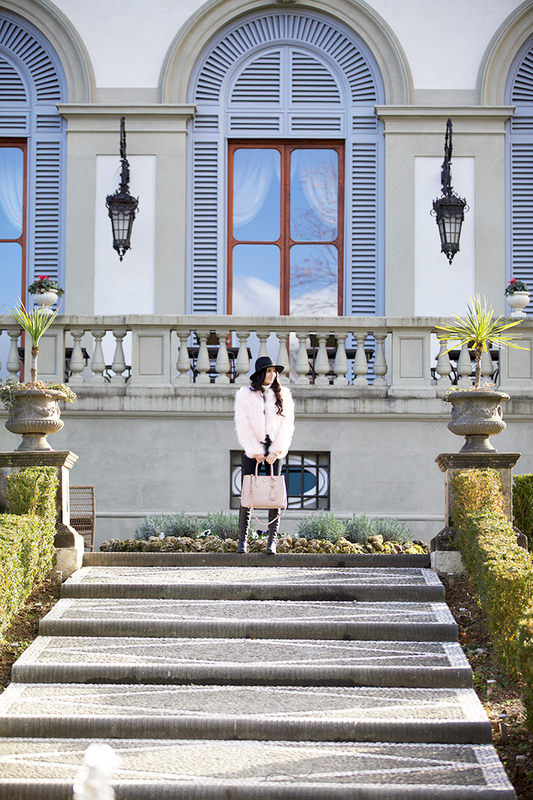 !.Perfect blush shade coat and bag! Your coat is gorgeous!! I love this look! Love, love love the jacket Rach. Actually, I love everything about the outfit. Gorgeous, as always. Rach, you look so gorgeous and glamorous in this look! I adore the fur coat, the color is so pretty and looks wonderful paired with the black! Thanks so much for the inspiration and I hope you’re having a great day so far; Happy Friday! I love this look! That pale pink adds the perfect touch against the landscape?? i love your eye shadow you seem to use often. Can you say which shade(s) you use? Is it a grey? Thank you!